Social studies for preschool children is all about exploring ME and MY World. Looking into our refrigerator, you will see apples, apple sauce, and apple juice. Red apples, yellow apples, green apples. It doesn’t matter, because my kids LOVE apples!!! They are part of our every day experiences. So how did the apples get to our fridge? 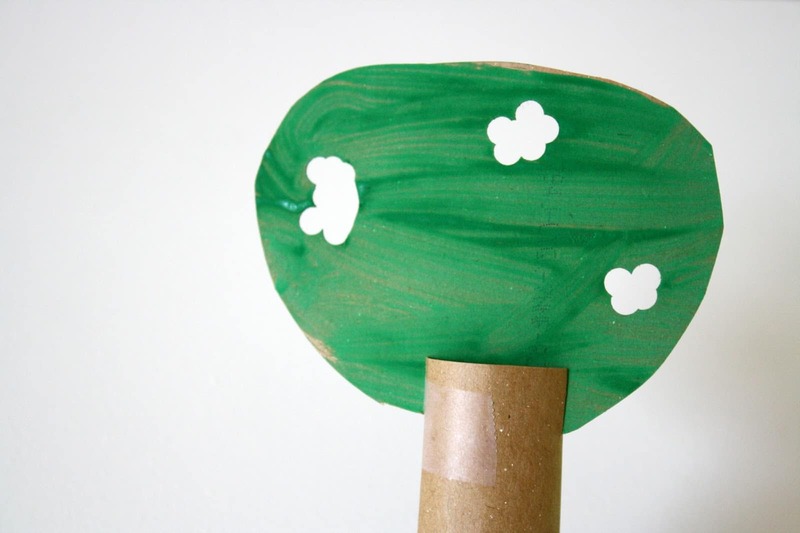 Let’s explore with these hands-on, fun Preschool Apple Theme Activities. 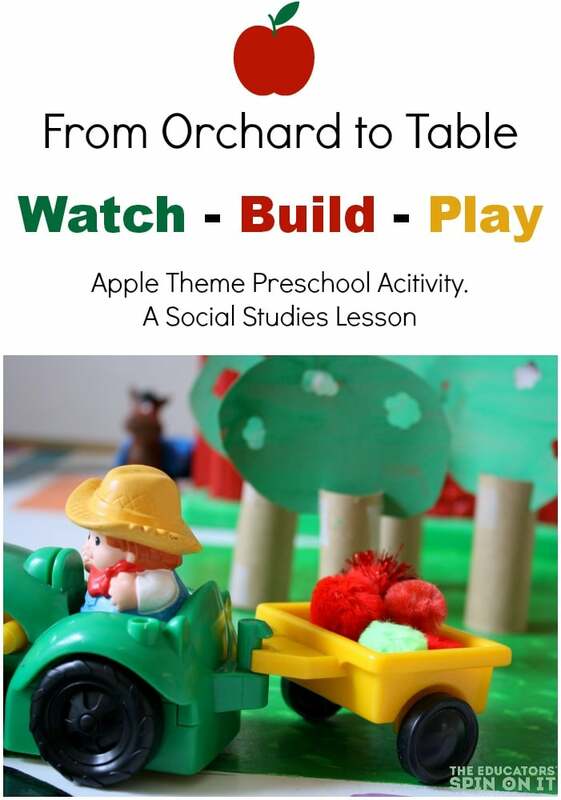 This week, our playful preschool theme is all about APPLES! In addition to making an apple tree sight word and counting apples, we are taking a closer look at the trip our apples took from the orchard to our table. Affiliate links. Have you ever thought about how apples get from the farm to the table? This activity combines social studies and technology for preschoolers. It allows them to visualize what happens at a packing facility. Apples travel from the orchard to a packing facility, to a storage unit, to the store, and finally – your home! What happens at an apple orchard? First, the apple trees are grown. In the spring blossoms form on the trees. Then, these blossoms turn into small apples. As time progresses, these apples grow and ripen. Then, starting in July, apples are harvested. Finally, the harvest continues as different apple varieties are ripe. See how one family farm harvests the different varieties. What happens at an apple packing facility? They are put on a convener. They are rinsed with heated chlorinated water. They are put on a rolling convener. The apples are sprayed with water and food safe soap. They are dried with a fan. Apples run through a drier. They run through a color and size sorter. Stickers are applied to tell consumers what type of apple they are. Apples are placed in trays or bags. The trays and bags are put in boxes. The boxes are then moved to a storage facility. Here is a video that shows this process. WARNING – my kids wanted to watch this over and over and over again. You may want to set a limit of how many times they can watch it BEFORE you hit play! Some apples are used to make other products such as apple sauce, apple juice, or even apple cider. A variety of apples are used to make apple cider such as the Eastern Red Delicious and Macintosh apples.See the process and equipment that is used to press and process the apples. How many minutes does it take to bottle 1,000 gallons of apple cider at this facility? Make a Model of the Path and Apple Takes from Orchard to Table. How to Make an apple orchard. Red (or green or yellow) pom poms. 1. First, adults prepare 4 rectangles for the tree trunks using the thin cardboard from the empty cereal box. Wrap them into a cylinder shape and tape for the trunk. Cut circles with the remaining cereal box. Hole punch several times close together to get a hole big enough for the pom pom to fit. This irregular shape will help hold the pom pom apples in the tree. 2. Nest, set the circles out for the child to paint green. 3. Then, when dry, assemble the trees. Cut 2 small notches into the tops of each cylinder and slide the circle tree together. 4. Finally, build the store, packing facility, storage unit and home. 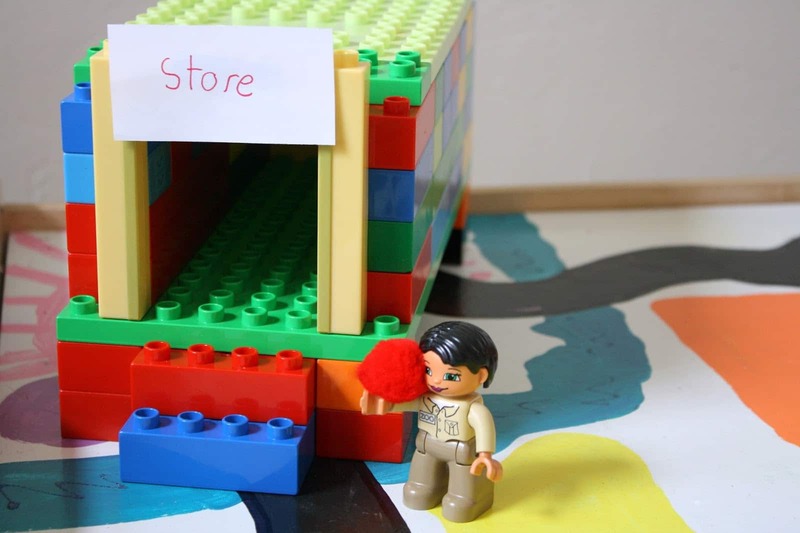 Use bricks, blocks or any other household materials. Play Re-enact the path that apples take to get from the orchard to your home. Have your child show you how the apples get from the orchard to their table at home. How has modern technology changed the way people get apples? Connect literacy with everything you do!!!! 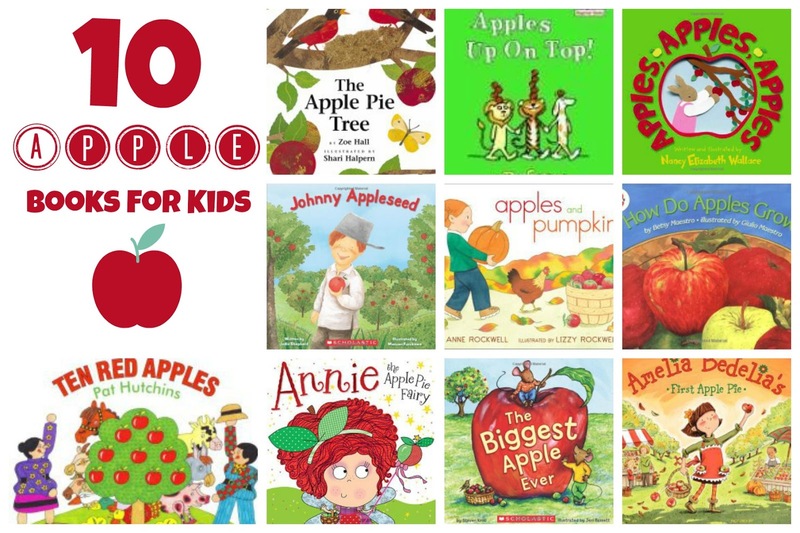 Here are 10 Apple Books for this thematic unit. 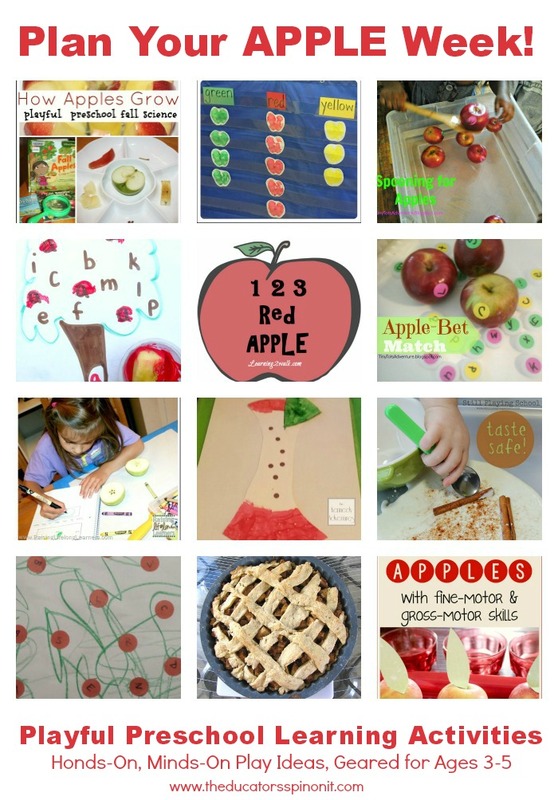 « Apple Theme Preschool Activities for Math, Reading & More!!! This is so creative and well planned! I love how the "apples" can be placed in the trees! How fun! Thanks for the YouTube links, too! We love to watch clips like these! Thanks Devony. We are screen free until 3, so have just started using this aspect of technology more. I find it's helpful to pre-screen the videos the night before because not everything on You Tube is kid friendly! What a great activity for playful learning! Our kids love relevant videos (as well as making them, too)! The apples play is a wonderful addition to fall-themed play! I need to try making videos with the kids – that sounds like a great idea! Oooh, I hope you have fun trying it out! I love this idea! Can't wait to watch the video clips with my preschooler. We just made an apple orchard today with a mat and tractors. The kids were having fun taking a tractor full of people out to the orchard to pick apples. Now, we'll add the other locations too. FUN! We are hoping to go to a real orchard next week! Apples are so much fun to learn with!!! They are everywhere in our house right now! 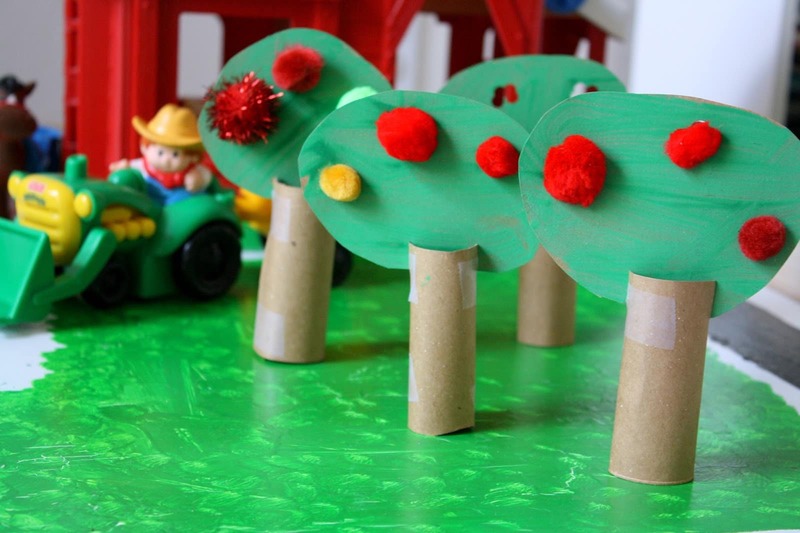 I'm off to find our Fisher Price farmer so we can make an apple orchard, too! My kids will love the YouTube videos! How handy! This is so fun! My little guy is going to LOVE the videos. Thanks for this awesome resource! I can't wait to show this to my son. He will love it as he is such a visual learner and loves process! We are headed to the orchard next weekend! No longer are apples sorted by humans they are sorted by machines now. With the help of the machines we can pick 5x as many apples as before and they are able to get them to the customer quicker. Answered by my 10 year old. I loved watching the videos. I bet you guys had loads of fun setting the scene. What a great listener! These statistics would be a great springboard into problem solving! Mine just asked if he could watch them AGAIN ( I think we are on the millionth time) luckily it is good preparation for our apple orchard visit coming soon! Us too! I just double checked that they were open. Hoping to pick some Gala and Zestar varieties! Thanks for the warning about the video – my son enjoyed watching it more than once too! I love the combination of pretend play, fine motor skills, and social studies in such a fun way! I LOVE this.i have enough toilet paper rolls to do it too! Such a great collection of resources and activities! Thanks for sharing! I love the pretend play apple orchard! My little one has a language delay and pretend play is a big part of what we do to increase her language use. This looks like it would be so much fun! Brilliant – We've watched the video's today and then went Apple picking in our garden where we are lucky enough to have 3 trees of our own. It was great to talk about how what we were doing would be done on a large scale.